Growing Greener: Bees and Alternative Pollinators! Posted 7/14/2011 9:19am by Ben Wenk. pollination, CCD, and native bees and remind ourselves that we humans aren't so keen and evolved to overcome our reliance on a bunch of trained, eusocial insects. When I was a youth and our farm was smaller and nearly entirely apples, we rented a lot of bee hives from our local apiary. I can remember these days well, since Dad would always meet the "bee man" after dark when the bees were docile and less active to strategically place them where they'd most effectively pollinate our orchards. As our farm progression continued over the years and our crops became more diversified, the peaches, apricots, cherries, and more recently berries, veggies, plums etc. are blooming earlier than the apples. By planting more diverse crops that bloom over a longer period of time, we saw more pollination occuring from native and feral bee populations because we were were providing more food for them over a longer period of time. pollinator populations, rented less bees and continued to have pollinator success. practices with the Food Alliance, we have established plantings of wildflowers to further increase these native bee populations. We'll also be maintaining our own bumble bee populations to help pollinate our sweet cherries. Posted 8/13/2010 11:01am by Ben Wenk. Here we are in August, the busiest harvest time of the season. We're picking peaches, plums, pluots, apples, pears, blackberries, tomatoes (need I continue)... but! Despite all of this, my lack of willingness to be inside when the sun is out, and the general rigors or late summer/early fall, I'm writing this blog entry to inform everyone about something very important. Three Springs Fruit Farm is Food Alliance Certified. I know what you're thinking - "fancy words, what do they mean"? That's a great place to start! Food Alliance is a nonprofit organization, established so that producers such as ourselves who effort every day to be on the forefront of what it means to be a sustainable farm can have our practices verified through an independent third party inspection. Food Alliance certification standards set a high bar for agricultural and food industry sustainability. These standards are available for anyone to view on their website. 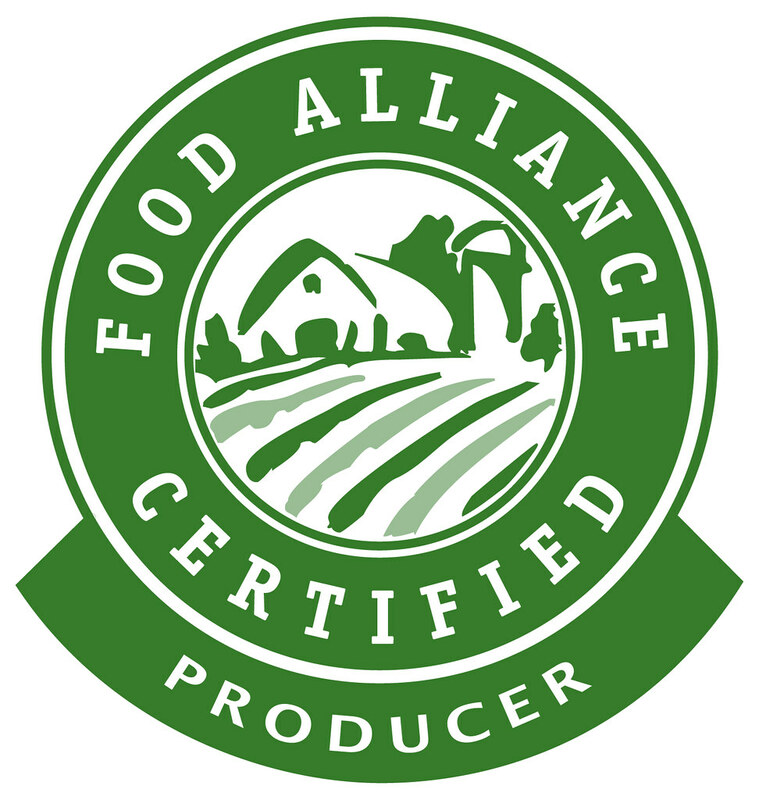 When you see the Food Alliance Certified seal on your food, you can be certain those who grew it practice intensive Integrated Pest Management (IPM), reduce their use of pesticides, and chose pesticides with low toxicities. You can be sure that the farm on which this food was grown preserves topsoil, conserves water, and doesn't allow excesses of soil, water, or nutrients to leave cropped areas and enter wild areas. You can rest assured a Food Alliance Certified producer maintains and promotes wildlife habitat on his or her acreage, that the employees of this farm are highly valued and treated as such, and that we are committed to continually improving our sustainability practices.The Food Alliance Certified seal denotes the most comprehensive third party certification in North America. Why did we pursue such an intensive undertaking? The answer was two-fold. First, we thought we deserved recognition for going the extra mile to grow our fruit in this way. While we always will think of our growing practices as "doing the right thing" and that's good in and of itself, it was worth it to have someone verify these things because, two, others have made claims all the time. The second reason we sought certification is because our word against someone else's is only so valid. When an uncertified grower makes a claim about growing practices or water conservation, each customer can assign as much truth to that claim as he or she would like. Now that we are a Food Alliance Certified producer, and our apples, peaches, pears, and cherries are Food Alliance Certified products, we can make these claims and customers can accept them with full confidence. It's not my word against the word of someone else - it's an independently verified fact. In a lot of respects, this is our way of rewarding our farmers market customers for their confidence in the past. You've met us, got to know us, and you've looked me and my friends and family in the eye at market and believed us when we told you that we're doing our best to grow your food in the most sustainable way we can. So here's the validation of what our farm has been telling you when you come to market. It's something we're passionate about and something we don't take lightly. Thank you for relying on our farm in the past and thanks for supporting your only local Food Alliance certified fruit growers in the future! here's a link to our press release (link) - thank you, PASA! Posted 5/20/2010 1:31pm by Ben Wenk. You're reading the third entry in the series of blogs devoted to our growing methods entitled "Growing Greener". My wish for these entries to to assure you through our candor and transparency that we truly are going out of our way to provide the very best produce for you and your family. Feel free to comment or contact us with any questions. Links to other GG blogs can be found at the end of this entry. A recent study, as published in the medical journal "Pediatrics", cites childhood exposure to organophosphate pesticides as a possible link to ADHD. As strict IPM (Integrated Pest Management) growers, a pesticide such as an organophosphate would be one of the last things we would ever want to have to spray and as a result, I'm proud to say that no organophosphate is sprayed on our crops. We would never sell anyone anything that wasn't safe to eat. Since this topic is a point of discussion in light of current events, I found this to be a terrific opportunity to address the "whats" and "whys" of the spraying we occasionally must do to prevent the failure of our crops. First, the most difficult things we need to control in our tree fruits are diseases, not insects. We control many of our most damaging insect species with Pheromone Mating Disruption, the subject of an earlier blog. When we spray an insecticide, it's only after the results of hours of scouting and insect data has been evaluated and some sort of remedy is required (another blog topic covered earlier). The determination of what to spray when an insecticide is required is not made on a whim. It's made based on whatever species needs controlled. We intend to control only this species and leave other species flourish when we can. During three different summers home from college, I collected insect data at the Penn State Fruit Research and Extension Center Entomology Department. The USDA and state funded program my wages supported was known as R.A.M.P (Risk Avoidance Mitigation Program). This program was devoted to the very topic in the news now - finding alternatives to organophosphate insecticides (OPs). OPs control insects because they are neurotoxins - they affect the central nervous system of the insects they control. OP insecticides have the same effect on an agroecosystem as a cannon shot - every insect is susceptible to nerve damage when these products are sprayed, whether their population was high or low, whether those insects damaged our crop or protected it. The newer products in the RAMP study might attack the insects' eggs or their ability to create an exoskeleton. These materials, to complete the above analogy, are like a single arrow shot directly at the problem insect ("pest"). Working in the RAMP program, I learned there was a better way than these OPs. As a volunteer in the RAMP program, my father learned how to use these softer pesticides (if an insecticide only works on eggs, you have to spray when those eggs are present - sometimes just a few weeks per year). In short, the RAMP program proved that these greener insecticides could be as effective as OPs if they are applied correctly by folks who are studying their agroecosystem and can study the lifecycles of these pests. Since these greener products are targeting specific insects, they pose very little threat to human health... I mean, except for the ones birthing offspring in external egg masses and the ones with exoskeletons, for example (if you meet this description, you might have a problem... and it'll have little to do with fruit). Having learned from these experiences, we were able to move away from these compounds years ago. While the OPs are still cheaper, we value the decreased toxicity of these products. Because of this, we allow the species that are natural enemies of these pest to flourish in our orchards, including the biological control agents we spread a few years back... but that's another blog for a different day. The results of our forward thinking approach is that we can confidently tell all of you that the fruits and veggies you buy from us are not sprayed with these harmful compounds. As we continue to educate ourselves in the winter and partner with Penn State in their research, we'll continue to be ahead of the curve in terms of providing the safest fruits and vegetables you'll find anywhere. Posted 7/15/2009 2:16pm by Ben Wenk. Hello again, and welcome to another Growing Greener blog entry. In this series of blogs, I try to expand into a little detail on growing practices since we are asked so frequently about them. Despite what you might think, I'm glad to answer so many questions about them because if you didn't ask, you didn't care! And if you didn't care, you'd just buy your produce in the grocery store anyhow! Plus, if you stand behind the way your produce is grown as we do, why wouldn't you answer all the questions? One thing I stress to customers who ask about our growing practices is "we don't spray unless we have to" and we spray "as little as possible". I can say this with such assurance because I personally go out of my way to see that it is true. The only way you can succeed in growing quality produce that is minimally sprayed is to know what's out there... or not out there, preferably. At Three Springs, this is accomplished with extensive pheromone trapping and monitoring. Scattered strategically throughout 300 acres of orchards at Three Springs are 102 pheromone traps. These traps use the same synthetic pheromones that prevent mating in most blocks of tree fruit. Similarly, males twitch their noses and fly through our orchards at night in search of mating opportunities. Just when they think they've locked in on something and perch themselves to investigate further, their tiny moth legs are glued to the paper at the bottom of these traps (see pic). There the pests stay until I arrive weekly to count them and remove them from their sticky final resting places. These counts are recorded, tabulated, and compared to the documented biological life cycles of the pests, as recorded at the PSU Fruit Lab as well as the trap catches at our farm for previous years. This way, we can keep track of all the variables. When will this species hatch and how big that hatch be? In what parts of which orchards are populations highest? Where are we least susceptible to insect damage? Is this management strategy performing better than this one? How's the mating disruption holding up? We can come up with a pretty good idea what all of these answers might be just from the weekly trap counts, especially compared to our historical trap data and that provided by the PSU Fruit Lab. This information combined with observations made me, Dave, and John on disease incidence and populations of beneficials we've observed can provide us with the information needed to determine what action, if any, is best. So, while growing tree fruits without spraying isn't feasible with the research we have currently, we can take all of these steps above and beyond to ensure that we are spraying as little as we can get away with! After all, it's not only our food too, it's our working environment we're talking about here! You can't farm for over 100 years without a healthy amount of sustainability in your operation. Posted 6/3/2009 2:54pm by Ben Wenk. Welcome to the first in a series of blogs concentrated on getting a little more "in depth" regarding the growing methods used at Three Springs Fruit Farm that make our fruit unique. Many of our customers have heard me talk about Pheromone Mating Disruption in peaches and apples at Three Springs Fruit Farm. It is one of the biggest assets to our Integrated Pest Management (IPM) program in its ability to control harmful pests without our having to spray for them. If you haven't heard about this important pest management innovation, allow me to bring you up to speed. Pests like Oriental Fruit Moth (OFM) and Codling Moth (CM) are a perennial problem in orchards. The larvae of these lepidopterans (moths) are what are best known as "worms" to consumers. These moths mate in and around our orchards and lay eggs on fruit and leaves. The resulting larvae emerge and find food and shelter in the fruit we'd spent so much time, effort, and money growing. We're not happy, you're not happy - we have to fix this problem! While it would be easier (and cheaper, for that matter) to spray a broad-spectrum insecticide on a schedule and have the piece of mind knowing these insects could not be surviving, we take a greener approach. Between 100 and 150 days before the approximate harvest of our fruit, we take our crew out into every bearing block of apples and peaches and have them attach ties to our trees that are filled with artificial insect pheromone. The pheromones (mating hormones) of these harmful species have been studied and recreated in laboratories. They've been synthesized and packaged in different dispensers (see pics) that release the female pheromone gradually and evenly over a period of approximately 100 days in most cases. So why go through with this? Wouldn't placing these in your orchards only encourage mating? To the contrary, when these ties are placed in the orchard at the recommended rates, they confuse the males in the area. With each tie smelling exactly like an available female moth, the males in the area are overwhelmed, confused, and unable to find a female with which to mate. With only a few females being mated, fewer eggs are laid and fewer larvae are born in the orchard, keeping them out of our fruit! Of course, it takes much more than the initial investment and the labor cost to make this practice effective. You must also be frequently monitoring the population of these insects through extensive scouting and trapping to be sure that the population of moths isn't so high that males are still finding mates in the disrupted blocks. Extensive scouting and monitoring are essential to any IPM program. Through our years of experience in mating disruption, we've also gotten better managing problems like border effects and applying disruption to match the geographical features of a block, prevailing winds etc. Research at the Penn State Fruit Research and Extension Center has shown positive effects from each successive year in a mating disruption program, research that's been confirmed in our trapping data. So, pheromone mating disruption is a lot like preventative maintanence in our orchard - if you can prevent the moths from mating, there will be nothing there to spray as we go through the season! What's more, when we're sleeping, at market, or trying to get away from work for a little while - the ties just keep on working without us having to look after them! And that's "the what it is", "how it works", and "why we like it" of pheromone mating disruption!